Saturday, December 14, 2019, 10:00 a.m. to 3:00 p.m. 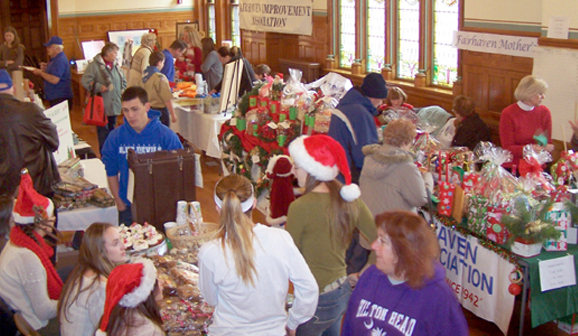 The Town Hall auditorium is filled with tables of sale items from about 25 non-profit groups, school groups and churches. Among the many offerings you’ll find gifts, holiday wreaths and centerpieces, baked goods, candy, ornaments, hand crafted items, T-Shirts, raffles, and silent auctions. There will be face painting and henna “tattoos” by Heart Body Arts, children’s activities, and live music performed by students of Fairhaven Public Schools. On the stage, Fairhaven TV will have a “green screen” photo opportunity. Food, including hot kale soup, chowder, meat pies, spinach pies, hot dogs, popcorn, coffee, soda, water, and baked goods will be on sale. Handicap accessible. Admission is free. Sponsored by the Fairhaven Office of Tourism. For more information email [email protected] or call 508-979-4085. 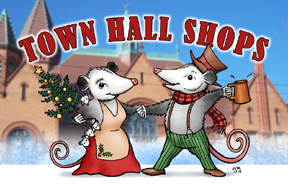 For other Old-Time Holiday events taking place on the same day, see: Old-Time Holiday.